This huge leather sewn crop was made by the manufacturer Adolph Lilienfeld in Hannover. It once had a wrist loop, the stamp on its remains reads 1915, maybe the year of manufacture. The company no longer exists. 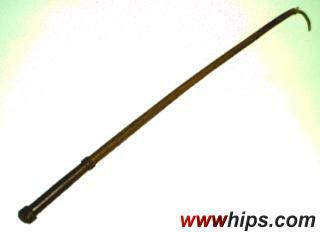 The whip is very light, seems to have a cane core without lining, the short fall is linen-covered leather. Note the unusual thickness, it´s about 1" at the handle. It´s not sure if this is either a mounted police whip or a dressage whip, both is possible.